Some might remember this from the run-up to RADwood SF about a year ago, just thought I’d share latest developments! In case anyone ever doubted the Prelute was really a truck. Just saw this 1998 Godzillawagon on carfromjapan.com for US$17k. Dang you California!! 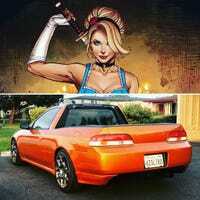 If a Honda Prelude is too impractical and a half-ton truck too bulky, what’s a guy to do? I present: the Honda Prelute. Ahh, carbon fiber wet lay ups. Like a toxic but really hot on/off again girlfriend, you know she bad for you... but you keep coming back to her cos she so pretty. Around this time I was starting to think about the final look for the build. To give myself some perspective, I threw a little happy hour at work and had people go wild with suggestions on post-it notes, in true SF Bay Area fashion. Gas can, oil jug and sockets, fitting just right in their cubbies. Can’t leave home without them, especially not in this car! A vehicle I built sitting atop a vehicle I’m building. Poetic, no? In May 2017, I: A) Was frustrated at work B) Knew I had July to myself with wife and 3 kids gone on a hometown visit C) Had a big surplus of nitrile gloves (bought 200 when I only needed 2) - so I decided to buy this junkyard special to start my first ever build. In May 2017, I: A) was frustrated at work B) knew I had July to myself with wife and 3 kids gone on a homeland visit C) had a big surplus of nitrile gloves (bought 200 when I only needed 2) - so I decided to buy this junkyard special to start my first ever build.